Boston Police report arresting two people at Mass. Ave. and Melnea Cass Boulevard early this morning with enough heroin to charge them as heroin dealers. Read more. Boston Police report a man, believed to be in his 20s, was shot at 911 Massachusetts Ave., near Chesterton Street, around 3:30 a.m. Read more. Boston Police report arresting two men on charges of possession of heroin with intent to distribute yesterday at Massachusetts Avenue and Albany Street in the South End. Read more. The City Council agreed today to bring in city and state public-health experts to figure out what to do about increasing amounts of problems they say are happening from Dudley to Andrew because of the continued shutdown of the Long Island shelter and treatment programs. Read more. So how's Mayor Walsh's tent working out...? Anybody driven the Mass Ave connector lately, worse than ever. People openly shooting up & smoking crack. Giving addicts a safe place to shoot up a step too far? It's essentially giving up hope on people who use IV drugs. One might even call this end-of-life or hospice care. The idea of such a facility takes away a person’s autonomy and essentially forces a social agenda that supports the normalization of IV drug use over active care and treatment. 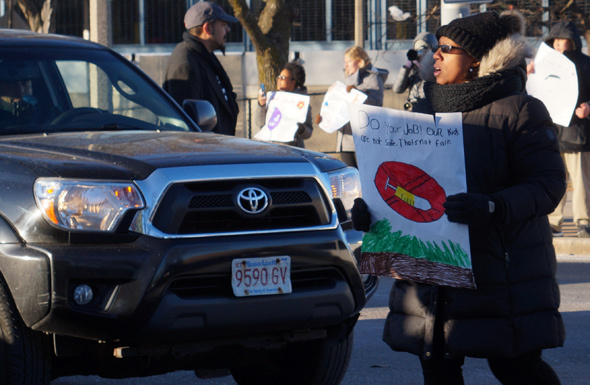 The Boston Sun reports that Mayor Walsh concentrated on the ongoing problems related to addicts and homeless people along Melnea Cass Boulevard and Mass. Ave. and on Boston Common at a recent South End Forum meeting. Two Globe reporters spend time with the addicts on the stretch of Mass. Ave. now known as Methadone Mile. It's an interesting, sad read, worth the time - and maybe an e-mail to the mayor's office asking whatever happened to Long Island. Perhaps there'll be a part 2 in which they talk to the people who live in that area (yes, there are apartments there) on how their lives have been changed by the influx. A WBUR reporter takes us on a tour of Mass. Ave. in the area of Melnea Cass Boulevard. As Pardini walks down the street, he explains the debris along the pavement. "There's a cap from a needle. That's an empty heroin bag right there," Pardini says, while warning me to avoid the discarded needles at our feet. Vice, meanwhile, takes us inside the Spot, a new location where Methadone Mile addicts can go and be monitored while they're under the influence.